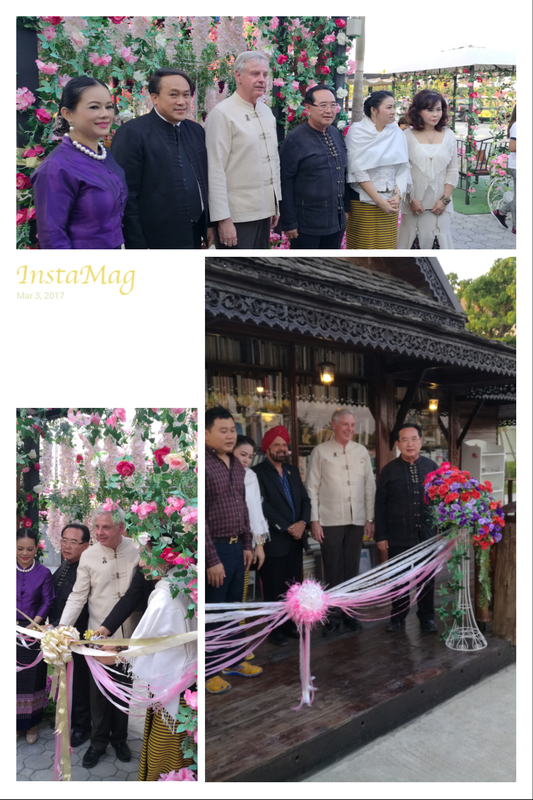 I had the pleasure of being invited and participating, along with an official from the Agriculture Department and Land Transport Department & other guests from Chiang Mai, in the grant opening of the gardens and library of the Aroyaka De Saraphi or cancer hope village that is naturopathic centre in Saraphi District of Chiang Mai operated by Dr Gamhom Suankaew. The gardens were inspired by a desire of a terminally ill patient to see flowering blossom trees that she could not get to high in the hills of Chiang Mai. The library is a collection of books on holistic and naturopath medicine. The gardens are ornamental so are most colourful and available all year to cater for the purpose of respite. An interesting centre that is working hard to support cancer patients with initiatives to provide hope and care that may not be otherwise available. They seem to have big plans for the centre and a few more years of work to realise their dreams. Dr. Ganhom explained that she is a specialist in natural cancer cures and alternative treatments with a background in and member of the American Naturopathic Medical Association. Having been inspired by her uncle who grew herbs when she was young, she wants to see an increase in the variety of herb production in Thailand to foster greater use of herbal medicines. Her husband is the vice president and director of Good Idea TV Thailand and America who previously spent 15 years in Australia graduating from RMIT in Melbourne. His mother and sisters are still in Australia operating Thai restaurants. He explained that they currently manufacture and sell a number of herbal products mainly in America with a growing market in Thailand. He is currently working to have some of their products approved for use in Australia. After the formal ceremonies and to celebrate the opening Ace and I enjoyed a festive evening with other guests involving food, a popular Thai band, awards to local photographers for their interpretation of the gardens and a donation to Saraphi traffic police for a new set of traffic lights for locally dangerous intersection. The band lead singer and front man was also an expert on the saw duang (Thai: so duang) which is a two-stringed instrument used in traditional Thai music. The sound is produced by the bow made from horsetail hair which goes between the strings made from silk. The bow has to be tilted to switch from one string to another. Saw duang is light and played vertically on the lap creating a bright tone. He was most entertaining. Khun Norachat and Dr Gamhom – thank you for including us in your event and best wishes on your endeavours.